A parody of traditional black-tie galas and customary Mardi Gras balls, “Cochon Cotillion” serves as Bridge House / Grace House’s biggest annual fundraiser. More than 800 patrons attended to support the organization’s critical substance abuse rehabilitation programs, which have served the Greater New Orleans area for 60 years. Jack Jensen and Anne Raymond were honored as Cochon Cotillion XXI’s King and Queen. 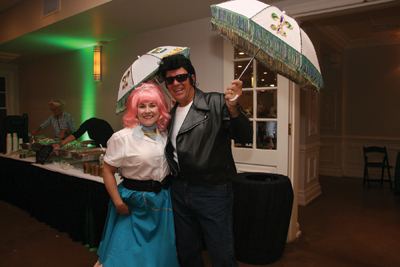 Event Co-Chairs were Arlene Rome and Tiffany Markey Truxillo, and Bruce Katz served as emcee. Mardi Gras colored uplighting and décor created a festive ambience at Mardi Gras World, which hosted a massive selection of restaurants and beverage purveyors serving specialities to partygoers. The ELS Show Band played in the Main Ballroom while Mike Morris performed in the Bienville Room. Dancers from Muggivan School of Irish Dance performed as guests began to arrive, and Double-Step Cloggers led a second-line entrance into the ballroom alongside the King and Queen, followed by the Court, Patron Party guests and Muggivan Irish Dancers. Later in the evening, the Warren Easton High School Marching Band led the royal court in a mini-parade. In addition to participating in this parade, The Pussyfooters and the Double-Step Cloggers performed during the band’s set break. Patrons enjoyed a Photo-To-Geaux Booth, caricatures and face painting from “Uncle” Wayne Daigrepont and the Porta-Puppet Players and psychic readings from Sonnet Ireland, The Hypnotic Librarian. The live auction featured a Kendra Scott Jewelry Pull featuring 50 mystery boxes and a raffle for a trip for two to Punta Cana; 75 silent auction item packages included a meet and greet and autographed memorabilia from New York Knicks Forward #42 Lance Thomas, a framed “Drew Brees” George Rodrigue Blue Dog print signed by Drew Brees and an original painting by Terry Marks signed by Drew Brees, Archie Manning and Bobby Hebert.